Whether you are Designing your Landscape yourself or having a Landscape Designer Basic Principles of Landscape Design will be valuable when you are beginning the process of transforming your home or business. These Basic elements are meant to be a guide; not a strict set of rules. Landscape Design is all in the eyes of the beholder. One of the main goals of your Design should be unity, or consistency and repetition. Unity is created when plants, plant group, or décor throughout the Landscape is repeated in groups. Consistency is where some or all of the elements of the Landscape come together to fit as a whole. Unity can be achieved by height, size, texture, and color schemes of different elements. 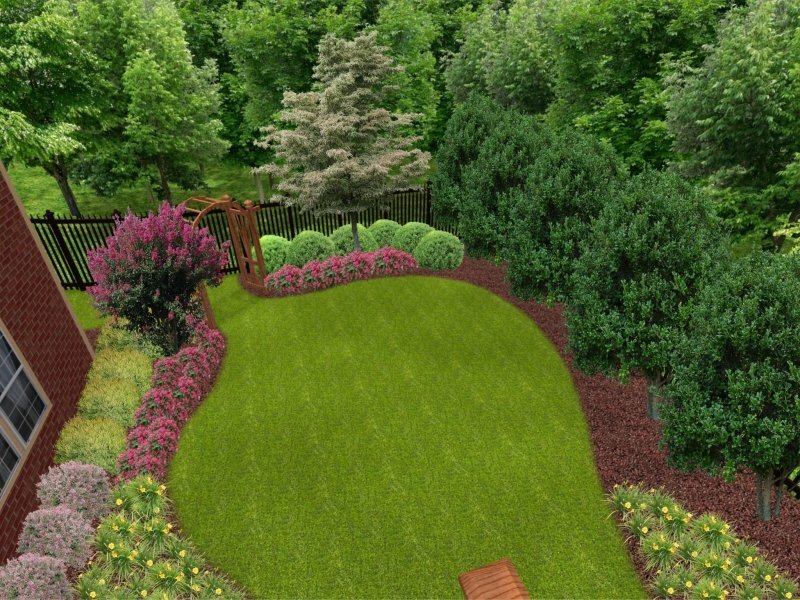 Creating themes throughout your Landscape Design is one way unity can be accomplished. When you use a theme, it is easier to relate to it, if you have a passion for it. For example, a butterflies theme would have plants that attract butterflies, as well as other decorative items that relate to butterflies. Unity should be expressed through at least one element, if not more, of your Landscape Design. One of the Principles of Design and art is simplicity. Simplicity is keeping things simple. Pick a few colors and repeat them throughout the Landscape, or keep décor to a minimum within a specific theme. These are ways of expressing simplicity in your Landscape Design. Balance is a sense of equality. In Landscape Design, two Basic types of balance are symmetrical and asymmetrical. Symmetrical balance is where there are more or less equally spaced matching elements of the Design on either side. It is like a mirror image or reflection. Asymmetrical balance is where textures, forms, and colors remain constant to create unity while hardscapes are more random. This principle is used to separate themes. Asymmetry is unbalanced, abstract, or free-form. Contrast and harmony are achieved by using plants. Plant height, color, or texture can be varied from one area to another but should stay consistent within its own theme. Color adds dimension and interest to the Landscape. Bright colors seem to make objects closer to you, while cool colors seem to make objects farther from you. Neutral colors and grays, blacks, and whites are best used in the background, white the brighter colors in the foreground. Colors can also be used to direct attention to a specific area of the Landscape. Natural transition is gradual change, and is normally achieved with plant height or color. It can also be achieved with textures, foliage, and the size and shape of other elements. Transition is where illusions are created. An example of this is where plants situated from taller to shorter will give off a sense of depth and distance. One of the Basic Principles of Landscape Design is line. This can be achieved in the move and flow of beds, walkways, and entryways. Proportion is where the elements relate to each other. This means that everything can be scaled to fit by creating different rooms in the Landscape Design. The goal is to create a pleasing aesthetic relationship among length, breadth, depth, and height. Repetition is achieved by repeating objects or elements that are alike. Too many unrelated objects can make the Landscape area seem uncluttered and unplanned.